Dwelling Place Below - Torah and Kindness: Yibaneh Yerushalayim - Our Magazine - Edition 2 - Now Out & FREE! 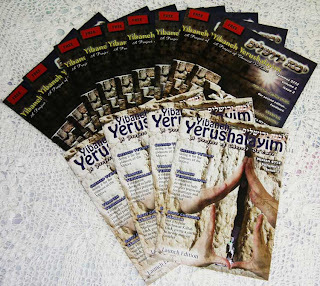 Yibaneh Yerushalayim - Our Magazine - Edition 2 - Now Out & FREE! Our second edition of our new magazine "Yibaneh Yerushalayim" is currently out! It's issued FREE and currently distributed to a variety of neighbourhoods inside Jerusalem, Beitar Illit, Efrat and other areas. It's delivered to private mailboxes, a variety of stores - including major book stores. And of course, it's available to everyone who is seriously interested in the magazine but who lives outside of Israel. We have just a few hard copies available, but for those wishing for a taste, an online version is available too. So what exactly is it all about?! It's our way of sharing with others - in print form (finally!) a little more about our activities. You'll get to find out more about our Bayit Chadash Gemach - a special fund to assist orphans to build their own homes when they marry, by donating brand new items. Donors will never be turned down - so long as they have brand new items, money or time to give over. These items are presented to the couple shortly before their marriage giving them the opportunity to select for themselves those things they would really appreciate! In our magazine, you'll find letters of thanks from those we've helped. You'll find stories from volunteers who help us in making these Simchas even more joyous. In our first edition, a dancer shares her joys at donating her time and talents to a couple who don't have enough guests to make the Simcha what it needs to be! In our current edition, there's a story from a make-up artist who gives of her time to bring even more colour to the face of a bride - all at no cost to the couple! You'll read about a miracle story of a family who donated to us and what happened just a couple of weeks after their donating! That's not all! You'll get to read some wonderful articles about some of the other work we're doing. We're all about Shidduchim, about making marriages happy and by no means any less important, teaching the laws of Taharat HaMishpacha - Family Purity. Check in with Rabbi Fishel Jacobs' (Kfar Chabad) to find out what a real marriage is all about. Read a story about Rabbi Moshe Feinstein and a message we should all surely take to heart! Our magazine is there for you! Most of all, we thank our advertisers who help us to pay for the costs of the magazine. They do a great job of assisting us to be able to spread Yiddishkeit in all its beauty. They help us to spread the beautiful values of a kosher Jewish marriage - and ultimately to help us help even more orphans in true need. We're not just a magazine about advertising others' products. Those that advertise receive double reward. They receive the rewards of clients who will turn to them - and they receive the rewards of knowing they've brought Yiddishkeit, kindness and goodness to so many in need! Of course - you can be a part of it too! Email Eliyahu directly to find out more! Artscroll or Koren Talmud Bavli - or Both? !